The Herbaliser originally hooked me with their instrumental beats I heard jammin’ on monkeyradio.org. 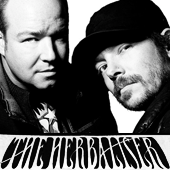 The Herbaliser is a jazz rap band formed by Jake Wherry and Ollie Teeba (Born Oliver Lawrence Trattles) in London, England during the early 1990s. Although currently releasing on their own label and having previously been signed to !K7 Records, they were one of the best-known acts from the Ninja Tune independent record label. They have released 11 albums, including two DJ mixes: one for Ninja Tune’s Solid Steel series and the other for Fabric’s Live Mix series. The Herbaliser’s album Same As It Never Was was their first release on !K7 Records. Their latest album There Were Seven was released in September 2012, on their own label Department H.